Make a well in the middle of the flour and add the eggs and olive oil. Using a fork, beat together eggs and oil, then begin incorporating flour, starting with the inner rim of the well. As you expand the well, keep pushing flour up from the base of the mound to retain the well walls (Otherwise the egg just gets everywhere). The dough will come together when half the flour has been incorporated. Wrap the dough in plastic and allow to rest for at least 30 minutes at room temperature before rolling or shaping as desired. *I tried two methods: I used a pasta maker and I used a rolling pin and rolled it super-thin, then loosely fold the noodles and use a sharp knife to cut the dough into noodles. 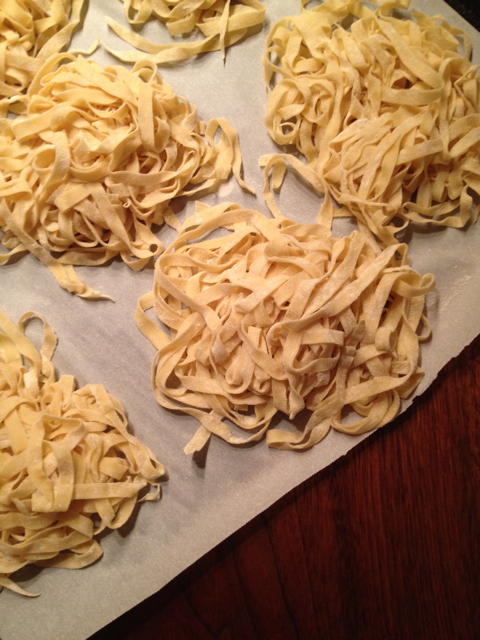 The pasta maker is obviously faster and creates more uniform noodles – that being said, the hand-rolled and hand-cut ones had great variety in texture that added interest to the dish.